Glory to you, Our God, Glory to You. Glory to You, O Lord, Our God, Who always overlooks our sins. Glory to You, O Lord, Our God, Who enabled me to see this day. Glory to You, O Most-Holy Trinity, Our God. I venerate Your ineffable goodness. I praise Your inexplorable forbearance. I thank and Glorify Your infinite mercy. For although I deserve every punishment and chastisement, You have mercy and do good to me with myriads of blessings. Glory to You, O Lord, my God, for everything. Amen. On July 6th Our Holy Orthodox Christian Church commemorates, honors and entreats the holy intercessions of the following Saints, Forefathers, Fathers, Patriarchs, Prophets, Apostles, Preachers, Evangelists, Martyrs, Confessors, ascetics, and Teachers of Our Holy Orthodox Christian faith: Righteous Father Sisoes the Great of Egypt; Holy Martyr Lucia the virgin; Twenty-Four Holy Martyrs who bore witness with Saints Lucia and Rex were perfected in martyrdom by the sword; Juliana the virgin-Martyr; Saints Archipus, Philemon, Onesimus. OUR HOLY FATHER SISOES THE GREAT OF EGYPT. An Egyptian by birth, he lived at first in Scetis then, after Saint Anthony's death, settled on the desert mountain on which St. Antony had earlier lived in asceticism and which was named after him. He learned humility through great struggles with himself, becoming meek and guileless as a lamb. Therefore God gave him the great gifts of healing the sick, driving out unclean spirits and raising the dead. St. Sisoes lived in the desert for sixty years, and was a fount of living wisdom for all the monks and lay folk who came to him for advice. At the time of his death, his face shone like the sun. The monks stood around him and marveled at this sight and, when the Saint gave up his soul, the whole chamber was filled with a wonderful fragrance. He entered into rest in great old age, in about 429 AD. 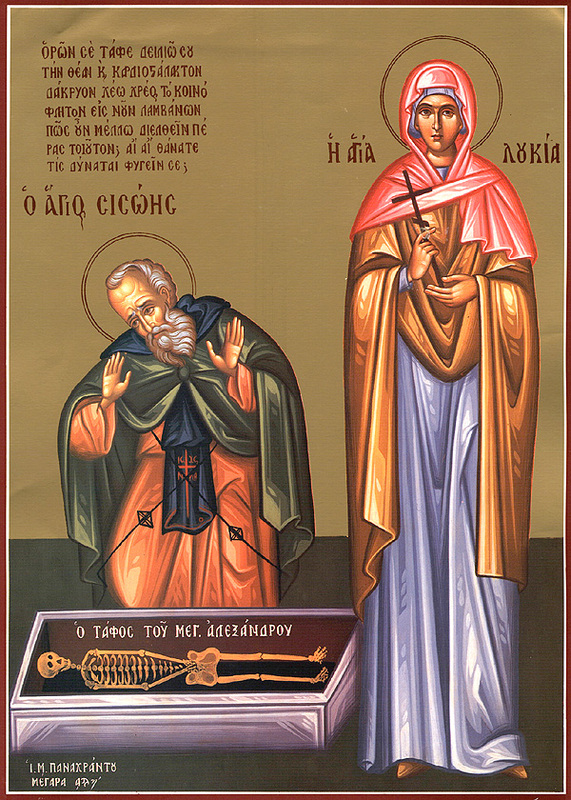 Saint Sisoes taught his monks: "When temptation comes to a man, that man must give himself over to the will of God, and acknowledge that the temptation comes upon him because of his sins. If something good comes to pass, he must acknowledge that it comes about by the providence of God." A monk asked him: "How can I please God and be saved?" The Saint replied: "If you desire to please God, withdraw from the world, separate yourself from the earth, leave aside creation and draw near to the Creator, unite yourself to God with prayers and tears, and you will find rest in this world and in the next." A monk asked St. Sisoes: "How can I acquire humility?" The Saint replied: "When a man learns to regard every man as better than himself, he thus acquires humility." Ammon complained to St. Sisoes that he could not memorize the wise sayings that he had read, to be able to quote them in conversation with others. The Saint replied: "It is not necessary. That which is necessary is to acquire purity of mind and to speak from his purity, placing one's hope in God." +By the holy intercessions of Your Saints and Holy Ascetics, O Christ Our God, have mercy on us and save us. Amen. 1. Just as all other things in this world, with all their qualities and actions, are only a symbol of the spiritual reality, so is worldly love. What people call love on earth is indeed only a pale symbol of the true, heavenly love. 2. All beings can be divided into uncreated and created. God is uncreated, everything else is created. Love is also uncreated. It is uncreated and eternal. Love is not an attribute of God. It is one of the names of God and the essence of God's being. Hence it was said, "God is love." 3. It was also said that God is the Truth and the Word. It is a wondrous word-truth which describes Him Who is always the same. "I am the existing One." Or rather-I am the same, the unchangeable, (the existing One), "Ο ΩΝ" in Greek. Word or Letter is the expression of the hidden God. And just like the Truth and the Word are eternally in God, and eternally are God, so is love. And just like the Word says of Himself "I am the Alpha and Omega, the beginning and the end," so love can say for itself-I am the Alpha and the Omega. 4. As Love, God has revealed Himself to mankind through the manifestation of the Holy Trinity in unity, Father, Son and Holy Spirit-one God through the Incarnation of God the Word (Logos). In the Old Testament, or in the Covenant of the Law, God was only announced as the Holy Trinity, so Love was just integrated into all the other commandments of the Law (Deut. 6:5; Lev. 19:18). The world was not ripe for accepting the teaching about the Holy Trinity and consequently about Love either. And these two things are inseparable. The commandment about love, the last among the commandments of the Old Testament, became the first in the New Testament. 5. In the pagan world there was a faith in a trinity, but not holy one and not an inseparable one. The Indians believed, and still do, in the Trimumurti, that is in three chief gods, one of whom is Siva, a devil and a destroyer who destroys everything that the first two, Vishnu and Brahma create. In Egypt people also believed in a trinity but as a family of three, tied by bodily love, where Osiris and Isis had a son Horus who was murdered by Osiris which then broke that monstrous marriage. Before Christ, people could apply their minds and effort to create great civilizations on all the continents of the world, but they could not reach the proper comprehension of God as Holy Trinity in Unity, and consequently, they could not comprehend God as Love (Agape). 6. Know and remember my daughter-the Mystery of the Holy Trinity is an inner mystery of the being of God. God could not reveal this intimate mystery of His to the peoples without the law or through the law. Nor could He do it through people, nor through great prophets. He only announced through chosen prophets, clearly and reliably, the descent on earth and the incarnation of His Son through Whom "the earth shall be full of the knowledge of the Lord, as the waters cover the sea" (Isaiah 11:9; Hab. 2:14). And the main knowledge that would be revealed by the Son is the glorious knowledge of God as the Holy Trinity, one of whose names is Love. 7. The Eternal Father loves the Son and the Holy Spirit. The Eternal Son loves the Father and the Holy Spirit. The Eternal Spirit loves the Father and the Son. All in an incomprehensible unity, indivisible and unmingled. It is all bodiless and spiritual. And so it goes from eternity to eternity, without beginning or end, without change, without decrease or increase, without the effect of time and space or any other outside occurrence. 8. To imagine God without the Son is the same as imagining Him without love. Every love needs an object to love. You know, my daughter, when someone says, "I love..." we immediately ask, "Whom do you love?" So whom else would the Father have loved through eternity, before the creation of the world, had the Son not been the object of His love? This would mean that He did not know how to love, nor was He Love in His essence before He created the world as the object of His love. And this would also mean that God received something with the creation of the world, something He didn't have before, and that He was thus changed. This is senseless and illogical and contrary to the Holy Scripture which testifies that there is no change in God. 9. God can be explained as Love only if He is explained as Trinity. Herein is the key to the mystery of love, my daughter. Always keep in mind. Believe the word of the great Saint Isaac the Syrian, "Love is sweeter than life" to which I add-"And it is stronger than death." 10. When we speak of love in the Holy Trinity, we always keep in mind that God is spirit and that all love in God is spiritual. The Father loves the Son so much that He is all in the Son. And the Son loves the Father so much that He is all in the Father. The Son of God testified to this with the words, "I am in the Father and the Father in Me" (St. John 14:10). And the Son is in the Holy Spirit and the Holy Spirit is in the Son. It says in the Holy Scripture that the Resurrected Christ "breathed upon the Apostles and said to them: 'Receive the Holy Spirit'" (St. John 20:22). One can give of himself only that which he carries within himself. 11. Love did not spring up out of the earth. It came from heaven. Venerable Cassian says, "Love belongs exclusively to God and to those people who have established within themselves the image and likeness of God." Conscious love relates to a conscious person. It does not relate to a principle or an idea or any other impersonal creation, but to a person. Where there is no reciprocity in love, there is no love. A principle or an idea or any non-conscious creation, whether of God or men, can never love us regardless of how much we love them. We speak not of that sort of love but of love which is from one person to another and which is "indivisible and unmingled". 12. "God is love; and he that dwelleth in love dwelleth in God, and God in him" (1 John 4:16). Ages and generations of mankind awaited eagerly to hear these light-bearing and life-bearing words, to receive them as guiding stars like the star of Bethlehem was. The Apostle had heard those words himself and he repeated them as he received them from his Lord. The God of Truth and Love is the Only Eternal God, the God Who has no contract of mixing with "gods" of lies and hate. By this revelation Christ has demolished all polytheistic pantheons in which human imagination had placed good and evil gods on the same level.